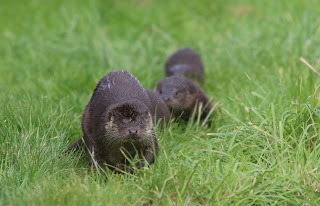 I must have spent so much time out in the Broads lately that Otters now think I am part of the landscape! Let me explain how, for a brief moment today, I became an Otter whisperer. I was out with my new toy (a parabolic microphone) when I bumped, yes literally, bumped into an Otter mum with her three cubs! Here are some of the recordings and a few photos. At first not really knowing whether to keep recording sound or take photos, I ended up doing both, sort of. I edited out where I dropped the microphone to the floor! It was all happening fast and I was trying not to be over excited, so some of the photos are a little blurry (the camera was on the wrong setting initially), and the microphone was not in an ideal position! Was I going to miss the moment? I've counted lots of fledglings this summer, it feels like it has been a good year and the parent birds have done an amazing job, so here are some figures and photos (click on them to enlarge) to celebrate it. I always do regular bird counts in the garden and this year I decided to keep a tally of fledglings, as best I could! See the table below for peak counts of each species & estimates of total fledglings. As you can see Blackbirds were the real stars, working so hard with a peak count of eight. It wasn't all plain sailing, as a few had feather issues which hampered their progression, and they seemed particularly dependent on my garden for mealworms. One I named Rumpy as he lost so many feathers in that area, and there was another with a weird thing going on on its throat (see photo)! It was nice to see the early broods still visiting the garden as they turned 'black' later in the summer. I recently completed an online course from the University of Oxford's Continuing Education Department, introducing me to the joys of GIS (Geographic Information Science/Systems) - I've always liked browsing maps, so to be able to create my own is just brilliant! 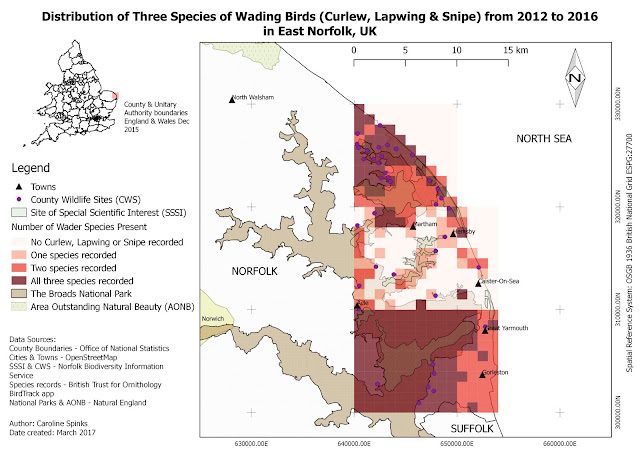 I thought I'd share my first map(s) - all about Curlew (CU), Lapwing (L) and Snipe (SN) in East Norfolk, which happens to be where I have been surveying farmland for evidence of breeding of these declining waders for the RSPB.